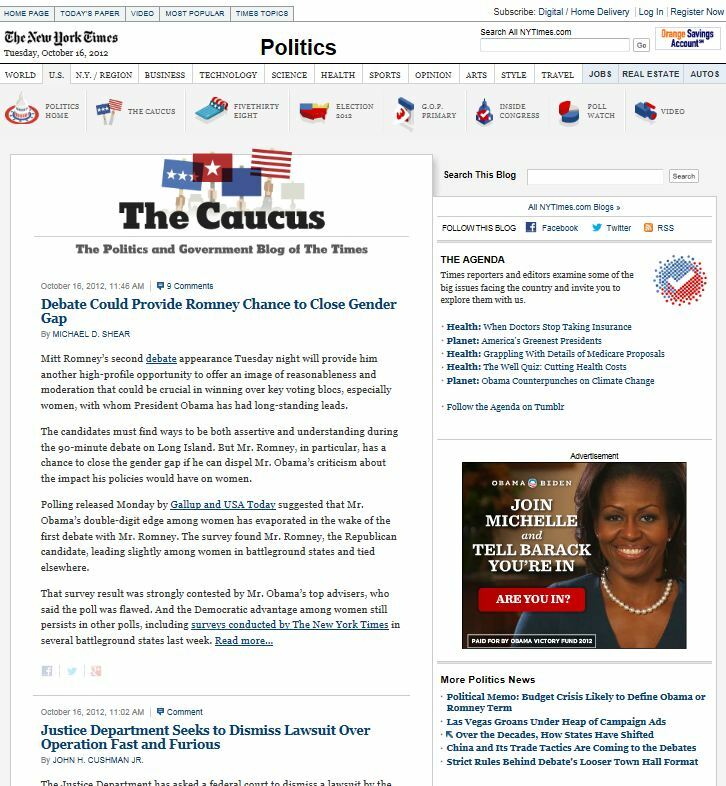 Site name and description: The New York Times, The Caucus, “The Politics and Government Blog of The Times.” The latest on President Obama, Congress and other political news from Washington — and around the nation — from the staff of The New York Times. Design overview: Standard blog set up with entries by the Times staff. The Caucus appears in Politics section of the NYT, easy to find under “Blogs” in nav bar. Each post in chronological order with link, engagement easy to access, easy to engage (Facebook, Twitter, Google+). Posts are easy to share as well as comment. Audience: For those interested in politics, specifically what is happening in Washington DC and around the nation. Business/Site Goals: Provide viewpoint, opinions and create dialog. Social media integration: Each blog entry allows you to comment or share via Facebook, Twitter and Google+. You can also follow The Times via Facebook, Twitter, YouTube or RSS feed. Reviews or analyses of the site: Pretty straightforward. Content is king, drives engagement. Posts try to engage readers and encourage comments and sharing.